Well, my theory about the scalp pain may have been off...There was some throbbing on the left side of my scalp today and yesterday after not feeling anything there over the past month. Not sure what that means....it's weird. I read an article today about the differences between empathy, compassion and sympathy and how doctors need to learn more about using empathy with their patients. I mentioned in my film, Shunt Chronicles: My brain, art and school (2015) how my previous neurosurgeon lacked empathy in regards to my situation. Link to Article: Why Doctors Need to Show More Empathy. About a week ago, I discovered I had an abscess on my back and it was drained at my doctor's office. Once the abscess began healing, the throbbing pains I've had on the top left front side and back right corner of my head are gone. I'm convinced I had the abscess since 2014, as I was in a wheelchair for a month while I was in rehab. I still have pain issues with my shunt interacting with everything in the area: weather, magnetic fields. The throbbing pains in my scalp had been there since my brain injuries in 2014. I was told the abscess had developed over months and could take months to fully recover. Watched the movie, Shaun the Sheep yesterday after borrowing a copy from my library. I didn't realize until I watched the film that one of the main themes was about brain injury. A character in the film, looses his memory and it shows how his brain injury impacted not only him, but also of the other characters in his life. It was also animated by one of my favorite studios, Aardman Animation. This summer, Regal Cinemas was having a $1 Summer Movie Express where you could see selected films for $1. I won't be able to see Shaun the Sheep on the day it will be at Regal Cinemas for $1, and I got a copy from my library. During the last week, I've had nothing but discomfort from my Aesculap ProGav shunt. I've come to the realization that it reacts to the weather and other magnets in the area. The last week or two it's been either severe thunderstorms and extremely hot outside. Both situations haven't been good for my shunt. I have pain and throbbing on the shunt valve plus in my abdomen from the distal catheter. There are also pieces of my old shunt (which was falling apart in 2014) behind my right ear and in my abdomen. This causes pain as well and I can sometimes feel pieces of the old shunt in my abdomen. I'm still trying to figure out to effectively manage the pain. Not much seems to be known on the medical end about how these programmable valves actually work. I think if more was known about them, they wouldn't be used as much. My new neurosurgeon even told me when I saw him earlier this summer, that he doesn't use ProGav shunts because they're temperamental and it takes a while before you even know the correct setting for the patient. We need Star Trek level technology when dealing with the hydrocephalus. I had to have eye muscle surgery in order to correct my double vision after having multiple brain injuries in March 2014. I was able to get a hold of my operative report from my eye surgery in 2015, which I had been curious about. After each operation I have, I order the images ( X Rays, CT and MRI scans ) plus the operative reports from the doctor. I like to read about what happened to me while I was under general anesthesia. tone to the lateral rectus. The left horizontal muscle tone was normal. the insertion and the sclera near the limbus. Part III: The remaining stump was excised from the globe and hemostasis was established with cautery. Both ends of the Vicryl were passed partial thickness through the original insertion and tied with a surgeon's knot. The conjunctiva was closed with interrupted sutures of 6-0 plain. Went to see the new neurosurgeon today. He looked at my previous MRI's from 2014 and my shunt x rays from 2014. He also saw the x rays I had done last week. In the MRI he showed me how there was a patch of scar tissue on the left side of my brain where my shunt used to be. He said the pain I've been feeling could be nerves still repairing themselves from the injuries I had in 2014. I also have slit ventricle syndrome from the damage caused by the incorrect placement of my shunt for 5 years. He said the type of shunt I have, proGav is temperamental which is one of the reasons why he doesn't use them on his patients. He had said they're tricky to program because you have to wait and see what the correct number (pressure setting) is for the patient. The some of the other types of programmable valves, you know instantly what the correct pressure setting is for the patient. He wasn't sure if the pieces of my old shunt (which are still inside my neck behind my right ear and in my abdomen) could be removed. Attempting to take them could cause additional problems for my shunt or cause another stroke. Unless there's a reason for surgery (obstructed shunt, infection) then I have this shunt until it gets obstructed again. I have to continue and take medication for pain, I've already decided I won't continue taking any medication after three months. At 1:30am this morning I was awake because I had shunt, scalp and abdominal throbbing and pain. 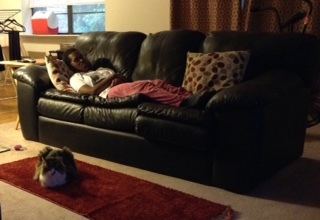 I was up until 5am with my cat, Stella as we watched some early morning television. I went to sleep around 5am and the was up again at 7am for breakfast. Took a nap from 12pm-2pm and awoke with the same forehead, shunt and abdominal pains I've had off and on since 2014. I had a much anticipated Shunt Series of X-Rays done after my appointment with the neurologist on Thursday. I received a phone call yesterday from the neurologist and she gave me the results. She had said the shunt system is in tack, except she noticed something: Pieces of my old shunt are still inside my neck behind my right ear and in my abdomen. I wasn't exactly happy to hear about this, as I thought these pieces had been removed from the inside of my neck during the surgery I had in March 2014. Not sure what the new neurosurgeon will say about this when I see him later this month. Does it mean I will have another surgery again to remove these pieces? Saw the new neurologist for the 2nd time yesterday. During my 1st meeting with her (in May 2016) I had asked to see a new neurosurgeon. At the time, she had told me most doctors don't take on new patients because they don't want to deal with the work of another doctor. She had said she would "see" if a neurosurgeon was available and would be willing to take my case, but she couldn't guarantee this would happen. I left her office feeling extremely frustrated because I couldn't go back to my former surgeon because my not so good experience with him: Photos of shunt placement. I decided to contact the social worker who I had seen in 2014 - 2015 to help me deal with the trauma I had experienced with my brain injuries. I went to see the new neurologist yesterday and she was like a different person. I had expressed my need to see a new neurosurgeon and to have a shunt series done. Without hesitation she gave me a referral to see a neurosurgeon at the hospital and to have a shunt series before I left the building that afternoon. I'll see her again at the end of September. I have an appointment with the neurosurgeon later summer and I asked my social worker to call him before my appointment. Having the social worker advocate for me expedited the process of getting new x rays and a new surgeon. This past Monday, I had a follow up with my eye surgeon who corrected my eyesight in March 2015. As far as the tests go, my eyes are in good health and have adjusted well to the surgery. I haven't had any issues with my right eye drifting to the right. It did do some drifting from March 2015-April 2015. I haven't had any since then. I still have some double vision when I look above my glasses, this doesn't affect my ability to look straight ahead, as I have single vision when doing so. Today was a better shunt day. For the last two months, I've had frequent nausea and pain/throbbing on the shunt valve multiple times during the day. Sometimes, I have pain on the top left part of my head which I believe is from the injuries I had in 2014. Today was a better, as the pain on the shunt valve wasn't as strong as it's been. For example, today the pain on the shunt valve has been a level 5 which is better than it was a few days ago, which was a 10. I didn't feel any pressure in my forehead today which was good. I've been playing phone tag with my neurologist and will have an appointment with her soon. I'll also have a new shunt series which will show how my shunt is working. The x rays will show whether the shunt is broken and the CT scan will show how the shunt is functioning. I expect my new neurosurgeon whenever I see him/her later this summer won't misread my x rays/scans like my last doctor did. Not sure why I'm still have the shunt pain issues. Maybe as I may have mentioned in previous posts, it's because of the type of shunt I have....I just don't know yet...We'll have to see once I get the images back. 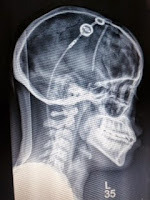 I heard my programmable cerebral shunt beep several times during the early morning hours and I had what felt like small explosions inside my head. I can only hear the device make noises inside my right ear. (where I am tone deaf) Since my brain injuries, I have special powers now. I can't fly or lift buildings, but I can hear the shunt do all kinds of things inside my body. The beeping and small explosions happened three times this morning between the hours of 1am - 5am. Perhaps it was adjusting itself. I hadn't felt sensations like this in months. The last time I felt the same small explosions and beeping sounds was over the summer in 2015. If I were on the Starship Enterprise, my shunt would've told me verbally what it was actually doing. Like a status update or something. The elevated pressure inside my head continues as do the scalp pains in different parts of my head. Is it scar tissue? Parts of my body still healing? Is the shunt working too well? Again, a status update would be helpful. For the last two months, I've had consistent pain from both my shunt and around different parts of my brain. I'm not sure what to do in order to deal with the discomfort. Pain medication doesn't work. However, I get scared when I feel pain like this. The pain in different parts of my head from nerves and muscles may be scar tissue healing itself form the injuries I had. I believe this to be the possible explanation. 2/2/16 – Felt fluid buildup at base of spinal cord. Backup of CSF? While in bed. Had issues with sitting up because of lower back discomfort. 2/6/16 – Pain, swelling, tingling sessions on left side of brain where ventricular catheter used to be and on top right corner of head. Felt pains in abdomen, distal catheter and in urethra in the morning. 2/9/16 – Pain on top right corner of head at 4am with pains in distal catheter while in bed. 2/18/16 – Swelling, sharp pains on left side and tingling pain on top right corner of head both in the morning and afternoon. 2/19/16 – Pressure in forehead during evening. 2/24/16- Pain in back of head, and forehead around 6:33pm. Nausea. 2/28/16 – Tingling, sharp pains on top right corner of head during afternoon hours after 12pm. Pain on left side of brain in the early morning. 2/29/16 – Pain and tingling on top right corner of head in afternoon/evening hours at around 6pm. *Pain on shunt valve, feelings of fluid moving slowly behind right ear. I can feel the shunt over draining and I have pain in my urethra. Since February, I’ve had pains in different parts of my head specifically in the back of my head and top left and right corners of my head. 3/18/16 – Pain on shunt valve multiple times in the morning and afternoon hours. Pain when moving head from side to side. Pain and tingling at top of head on right and left corners of head in the afternoon. Pain from shunt on top of the valve and in the stomach/abdomen. Throbbing and pain on top left side of head. 3/23/16 - Pain on shunt valve multiple times specifically during the afternoon around 3:43pm. Dizziness in forehead during early afternoon 12pm-3pm. Felt light headed and dizzy with pains in abdomen/stomach. Throbbing and pain on top left side of head. 3/24/16 – Pain, throbbing in distal catheter in abdomen at 1:04am, pain behind right ear throbbing on distal catheter. Sharp pains on left side of head and on shunt valve multiple times while trying to sleep between 9pm-12am. Pain at top, back of head when moving head from side to side. Cannot sleep on right side due to pain in distal catheter behind right ear. Today is the one year anniversary of the eye surgery I had to correct my vision as a result of my multiple brain injuries in March 2014. I've been driving for a year and I've gotten more comfortable in the car. I'm still trying to navigate how to effectively deal with the pain from the injuries I had. I have throbbing pain on the left side of my brain (where my shunt used to be) Additionally, the shunt causes pain as well and has a mind of its own. There's throbbing in the back of my head by my cerebellum (from the chiari malformation from the shunt over-draining from 2009-2014) Tingling on the top right and left sides of my head. There are pains from the distal catheter portion of my shunt in my stomach/abdomen. The distal catheter pumps csf fluid into my abdomen, it burns. I hear the shunt too, only in my right, ear where I am tone deaf. Pain medication does nothing to alleviate my symptoms. The neurologist I've been seeing since 2014, thinks the pain I feel in my head is because I'm depressed. I know this is not the case. The medication I was given to treat my 'depression' does nothing to alleviate my symptoms. The good news is he was concerned about me when I saw him earlier this month. I'm convinced when I see him again in June, he'll finally see my symptoms are not from "depression' and are a direct result of the trauma I experienced in 2014. Signed copies of the film based on my brain injuries is available here. Still trying figure out a way to deal with the pain I feel as a result of the injuries I had. Since 2014, I've had pain in the back of my head by my cerebellum due to the chiari malformation I acquired from the shunt revision in 2009. I also have slit ventricle syndrome as a result of my shunt over draining between 2009-2014. I feel pain in the nerves and the ventricles due to the damage and my body still searching for the shunt to be on the left side of my brain. I've tried sleeping on my right side, which has helped a little with the pain issues on the left side of my brain. I'll be celebrating my injuries as a second birthday all month. In 2014 I was in rehab from March 11 - April 5. Today I went to the movies and it was nice to get out of the house. I'm not able to work right now and I'm home 90% of the week. Things will be this way until I start vocational rehab sometime this summer. On 1/19/16, 1/26/16 and 2/2/16, I received psycho-education testing to determine the level of brain damage after my multiple injuries in March 2014. Each session was two hours long and there were three in total. According to the tests I took which included Benton Visual Retention Test, Haptic Visual Discrimination Test and the Woodcock-Johnson Visual Education Battery exams I scored at different ranges. Overall, there's been a slight improvement in my IQ since 2014. Still having math and some memory issues, but that was always the case I just need extended time. I'm still unable to work right now and I can take Adult Education Courses at Rockland BOCES which will be paid for by Rockland County Association for Learning Disabilities. I can receive employment assistance through ACCESS-VR to help with interview skills and job placement. I'm still dealing with brain and nerve pain as a result of my injuries. Trying to figure out how to deal with the pain. The shunt causes me pain more than it did before most likely because of damage and two conditions I have now: slit ventricle syndrome and chiari malformation. Both were as a result of my shunt being place on the wrong side of my brain. I learned through online brain injury and hydrocephalus support groups that programmable shunt valves can be affected by the weather. I've noticed when it gets cold outside (depending on the barometric pressure) I have pain on the shunt valve and on the distal catheter in my brain. Because I am hyper sensitive now because of what happened to me, I can hear the shunt as well and feel when csf gets re-absorbed into my abdomen. The csf burns. As mentioned in previous posts, I can hear my blood pressure behind my right eye. It's kind of cool and very bizarre at the same time.